A compact, upright tree with lightly scented flowers in early spring through early summer. 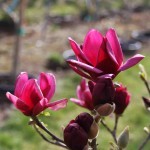 Beautiful black-red buds open to small globular tulip-shaped blooms of rich maroon-purple. It lives up to it's name granting the three wishes of color, fragrance, and form. It prefers full sun in rich, well-drained soils.